What’s in a Well-Designed Enterprise Resource Planning (ERP) System? When you’re looking for a well-designed ERP system to support your business, here are a few things to keep in mind. A well-designed ERP system integrates your information across your organization. This is accomplished using a single database that automates the flow of information within the system. A well-designed ERP system incorporates many aspects of business – from CRM for providing quality service and optimizing selling opportunities – to real-time inventory and warehouse management to keep all of your organization’s information accurate at all times – to reports that provide you with the information you need to plan ahead and move ahead. A good ERP system is modular, which allows you to start with only the components you need, and add features and functionality as you grow. It is flexible and can be customized to accommodate the changing needs of your business to keep up with your industry. Each component is tightly integrated so an update in one area communicates the information to other areas, promoting efficiency and accuracy to result in higher returns on your investment. When shopping for your ERP system, be sure you have control over your use of the software by customizing your business rules. This allows you to control important core behaviors within the system without costly modifications and programming. Specific features to look for when considering an ERP system are determined by your business requirements. You already know the importance of CRM, inventory management, warehouse management, and order management. You may also want to consider eCommerce for selling online and opportunities to attract new customers. If you accept credit card payments, you’ll also need to be sure your ERP system is PA-DSS-Validated to meet your PCI-DSS requirements. 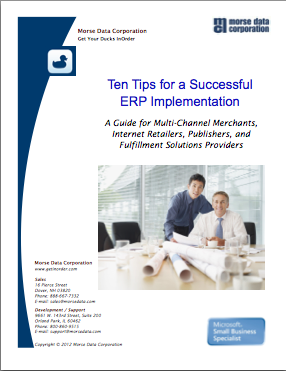 Consider using your ERP system to communicate with your customers. Let them know about new products and promotions. Abandoned Cart Email messages are proven to be effective in increasing sales, as well. You can also drive traffic to your website with newsletters, reminders, and other targeted marketing efforts via Email. In addition to all the capabilities of a well-designed ERP system, look for a good ERP vendor who is responsive to you, with implementation assistance to make the transition as smooth as possible. Be sure it provides training and technical support to make sure the system is in the hands of qualified users, as well as continuous improvement and on-going communication to be sure you are always aware of the most current technology.